"I'm leaving on a jet plane Don't know when I will be back again." Unlike the late John Den- ver's hit song, Philippine Airlines did not leave Tag- bilaran City on jet planes but on ancient Fokker 50s. And like the song, PAL does not know when it will be back again. PAL scrapped its flights to Bohol effective February 16, 1999 hammering the last nail into the coffin of Tagbilaran's remaining air service. No other commercial passenger lines had flown to this island-province. The pullout came more than a year after PAL discontinued its Cebu-Tagbilaran-Cebu flights due to competition from fast seacrafts serving the same route. The flag-carrier had earlier set minimum conditions to the Transportation Office before it would allow its Boeing 737 planes to land in Bohol. The demands had not been acted upon. PAL had asked the ATO to move all landing hazards, such as high television antennas atop houses near the airport and trees along the path. It had sought the upgrading of the airport's fire truck. Romeo Dagodog, ATO head in Tagbilaran, tried to negotiate for the release of a Category 6 fire truck (capable of loading fire retardant chemicals instead of water), from the Mactan-Cebu International Airport and, later, from the Cagayan de Oro and Zamboanga airports. However, officials of these airports would not release any of their modern fire trucks, which they were maintaining in compliance with standards set by the International Civil Aviation Organization (ICAO). Dagodog's last option was to enter into a memorandum of agreement with the Bureau of Fire Protection in Tagbilaran to allow the use of one of its fire trucks and study the possibility of converting its capacity to load fire retardant chemicals. The ATO also plans to extend the airport runway by 100 meters and relocate the perimeter fence based on new boundaries. But it has yet to look for funding sources for the projects. The runway extension costs P17.5 million or P7.5 million more than the amount paid for the same length of expansion made during the Ramos administration. This time, it will affect privately owned and already developed properties. Still, ATOs efforts could not guarantee the return of the PAL flights. 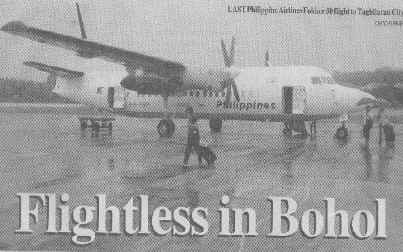 The pullout of the Fokker 50s revealed a bigger problem: the inadequacy of the Tagbilaran airport for wide-bodied aircraft, like the B737. Last year, PAL conducted a test flight to determined if it could field the bigger B737 to Bohol. While the airline has yet to disclose results of the test, it was not lost to observers that the probing plane had to circle the city three times before it landed successfully. A prominent businessman who witnessed the difficulty in landing raised concern about safety. "You cannot get on that (B737) flight." And because only a few passengers were on the plane at that time, many people feared that PAL would not find it viable to open a flight route to Tagbilaran. Passengers paid P2,200 for a Manila-Tagbilaran flight aboard the Fokker 50. Definitely, they would be paying more for a B737 seat. Taking the Manila-Cebu flight was cheaper (P1,800 for regular flights and as low as P900 for dawn flights). Thus, the Tagbilaran route faces tough competition even before it can take off. A little-known document prepared by Swedavia, a Swedish firm that conducted a feasibility study for the Philippine government, virtually dissuaded further investments in the Tagbilaran airport. In its 436-page report submitted to the ATO in 1994, Swedavia noted the constraints of the airport, such as limited runway approaches because of high terrain. The straight-in approach to runnway 35 is obstructed by the 196-meter Biking Hill while the approach to runway 17 is blocked by the Maribojoc mountain range, with elevations of 1l,000 to 13,000 meters. The study said the airport had virtually no space for expansion. The fence is located at the property line for the most part of the 50-meter distance from the runway centerline. Houses have been built outside and even along the fence. The study said the development of a 150-meter wide strip as a minimum requirement for B737 operations would "require considerable additional land on both sides of the runway and, as a consequence, relocation of existing residential developments." Swedavia suggested a runway that was 2,000 meters long and 45 meters wide. This could not even be met by ATO's present efforts to extend the runway to 1,800 meters. For an obstacle free approach area, housing will have to be severely restricted farther than 1,000 meters, the study said. This could mean the relocation of structures 1,000 meters away from the airport, such as the Immaculate Heart of Mary Seminary and the Immaculate Heart of Mary Parish Church. Since the airport is "very close" to the city proper, "commercial and residential areas will be subjected to severe air and noise pollution," the Swedish firm said. Thus, it recommended minimum investments in the airport and speed up development of a new facility at a more suitable site. Swedavia pointed to two alternative areas on nearby Panglao Island, which is linked to Tagbilaran via a causeway. One site cuts across Barangays Tawata to Bil-isan while the other straddles Barangays Bolod and Libaong. Vice Gov. Edgar Chatto supports the relocation move. He said the present site could no longer serve Bohols long-term needs and its continued operation would only restrict the citys vertical planning. "It (the airport) served the purpose of Tagbilaran when it was still a sleepy town," he noted. At present, the ATO can only make do with remedial measures while the proposed Panglao airport remains a mirage. It confronts the same old problem of no funds. Records obtained from the Central Visayas Regional Development Council showed the proposed Panglao airport, estimated to cost P323 million, is due for implementation in 2002. Even that is not assured because funding sources are not clear. The provincial government is not even halfway through the stage of acquiring land, having paid for only 33 hectares needed for the project. It already spent some P10 million from the Department of Transportation and Communication and needed P34.8 million more to buy the remaining 87 hectares at P40 per square meter. In the meantime, Boholanos will have just to dig for a long wait for the next PAL flight. The provinces is expected to suffer a slump, as tourist would prefer other places accessible by plane. For now, the people can only hope that ATO meet PALs minimum runway requirements so it can turn on its tower and runway lights again.